Spring is the perfect time to get your outdoor area summer-ready. With summer and barbeque season just around the corner, now is as good a time as any to transform your backyard into the perfect alfresco entertaining and dining zone. An alfresco area adds a new dimension to how you entertain while enhancing the appeal of your property. 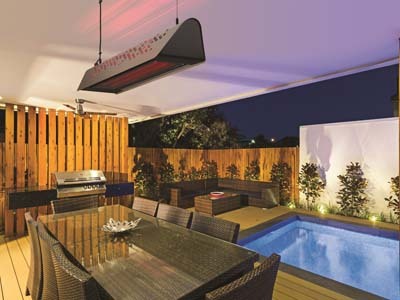 Begin with an outdoor kitchen, one of the biggest trends in Australian home design. Here’s how you can build the ultimate barbeque area in your backyard – easily and affordably – through smart selections of low-maintenance and multifunctional products, and without spending a fortune. Set aside a small area in your backyard to create a small paved courtyard. This will provide a solid foundation to place your cooking equipment and furniture. Make sure this spot is a little away from your doors and windows to avoid smoke from the barbeque drifting inside. Since your outdoor barbeque area will also serve as your dining and entertaining space, select a paving product that is easy to maintain and can withstand high foot traffic. Concrete pavers are great as they’re hard wearing and can withstand harsh elements. Consider a paver with a smooth surface such as the Euro Classic range from Adbri Masonry – they’re easy to seal, clean and maintain over time. When designing your outdoor barbeque area, there are a number of different things to consider. Space, for instance, is an important consideration – if your garden is small, tucking away the barbeque in a corner or against a wall is a good idea. However, if you have the luxury of a large backyard, go for the complete outdoor kitchen experience, featuring a built-in barbeque with plenty of space for prepping, cooking, serving and cleaning. Installing a range hood or fan is also a good idea to avoid annoying the neighbours. Once you have set up your grill, make sure you have all the right tools and cleaning supplies for easy maintenance. It’s recommended that you give your barbeque a good clean with warm soapy water after each use. If you are working with limited space in your backyard, get practical in your choice of furniture and equipment. A key objective would be to avoid clutter at any cost. Extending the functional value of the products you select for your alfresco courtyard is important. Garden walls can double as bench seating using Adbri Masonry’s AB Courtyards blocks, while clever lighting and heating products can cater for intimate and more extravagant dinners as well as a casual ‘neighbourhood barbeque’. When you are investing so much time, effort and money in your alfresco area, it makes sense to be able to use it all year around. Incorporate an appropriate heating and lighting solution to create a comfortable ambience, especially when you are entertaining in the cooler months. Though portable gas heaters can do the job, they’re hard to store and can become an eyesore. Take a more modern approach by installing a ceiling mounted heating and lighting option, and for true style, check out a two-in-one solution like the IXL Fresco Aurora outdoor heater. The IXL Fresco Aurora outdoor heater combines ambient infrared heat, dimmable task lighting and coloured mood lighting in one cleverly and sleek designed unit. The best part is you can control it using a free app on your smartphone.